Week 9 of The Great British Bake Off, the semi finals and Patisserie week, was a good one. I think it might be one of my favourites this series. I never imagined I’d be making Fondant fancies but I found myself in the kitchen with a ruler and a lot of sugar. Palmiers to those not in the know (that included me) are a biscuit made from puff pastry. That’s a no from me. I simply do not have the strength to roll out pastry and butter. A Savarin is a cake that includes yeast. It also requires a pretty intricate baking tin along with a bit of chocolate work, making a caramel, piping cream…..no. So that left Fondant Fancies. Now I know that they involve a few processes but I actually enjoyed making these and am a little bit proud of the finished result. I am slimming at the moment and so baking every week makes that quite hard. My way of managing this is to only make a small amount and so I adapted and halved Mary Berry’s recipe. 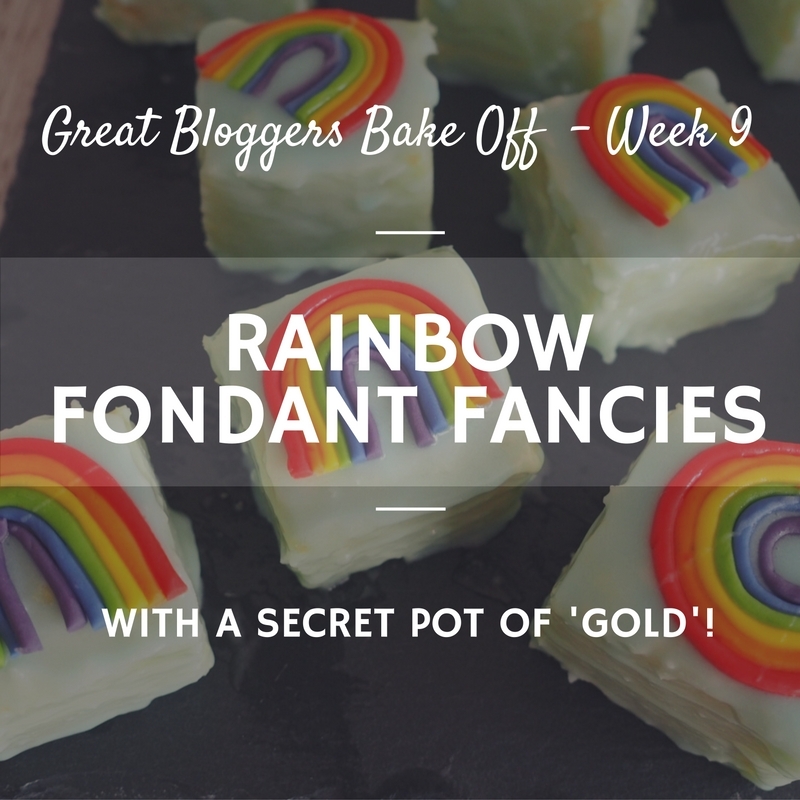 This is how I made Rainbow Fondant Fancies with a secret pot of ‘gold’. First I made my cake batter. 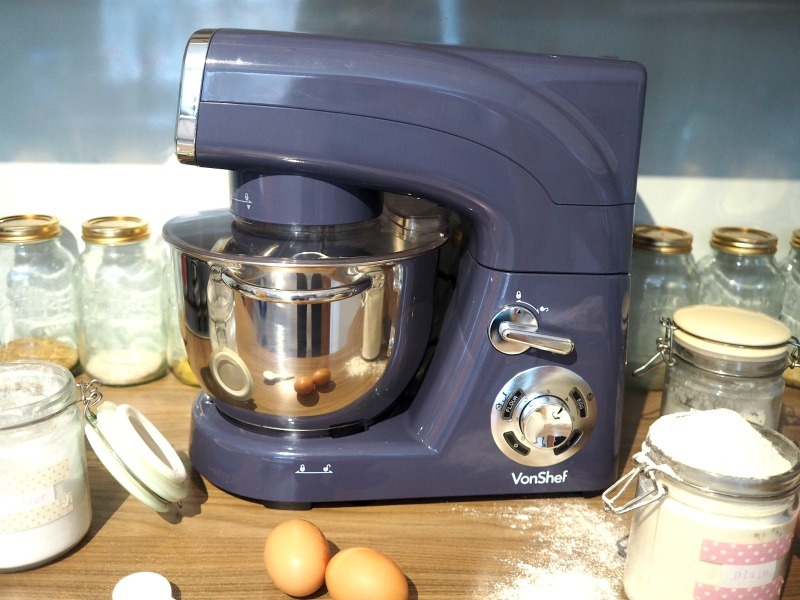 I used my gorgeous new Vonshef Mauve Stand Mixer from Domu. I used it last week but this week it was really tested and used for each stage. I have never owned a free standing mixer before and it made baking so much easier. I baked the cake and left it to cool. Next, I made the butter cream and was excited to try the splash cover. It was perfect and unlike when I make buttercream with my hand mixer, there were no clouds of icing sugar when I began! I could also add the almond essence and milk without having to remove it. Now it is time for the secret surprise. I call it the pot of ‘gold’. If you can find chocolate gold nuggets, thats what I was hoping to use but in the end I had to make do with mini chocolate smartie type sweets. I actually used an icing nozzle to gently cut out a cylinder of cake from the middle of each square. I then filled the hole with chocolate treasure, trimmed the piece of cake that I removed from the middle and then placed it back on top. Then it was time to coat them with buttercream. I found that the best way to do it is to cover each side of the cake on one board, then, put a scrape of buttercream on the board I would like the cakes to dry on, place a cake on it and then cover the top of the cake with buttercream. 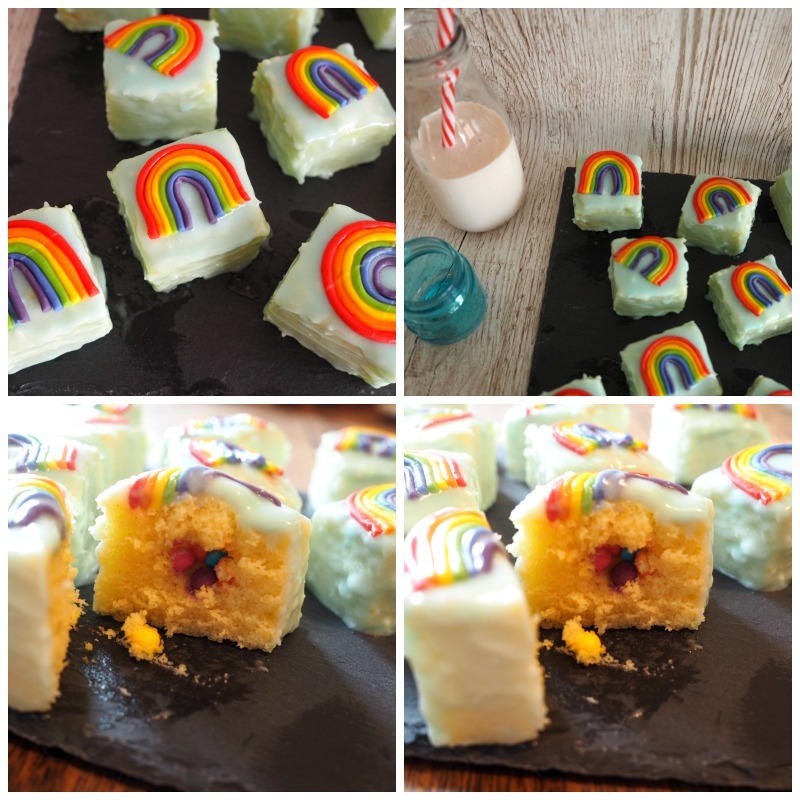 Whilst the icing dried a little (I’m not sure if you should ice them with fondant icing when wet or dry but this is what I did), I made the rainbows. I totally underestimated how long this would take but I loved the result. I took pre made fondant in red, yellow, green and blue and then mixed to make orange and purple. I rolled them into thin lines – about the thickness of a cocktail stick and then lined them up next to each other. Next, I gently curved the strips to make a rainbow shape, trimmed and gently patted with a slightly wet finger, I used the water as glue to stick all the colours together and then left them to dry. The next step is to make a liquid fondant icing. Chop the block of fondant icing into small cubes and then using a paddle attachment if you have one, beat the fondant unit it starts to soften. Add the water, a few drops at a time, waiting for them to be combined properly until you add more. When you have a liquid smooth icing, add a small bit of food colouring and mix until the colour is mixed in properly. Now it’s time to ice the cakes. I tried 3 different ways and the last was definitely the easiest. 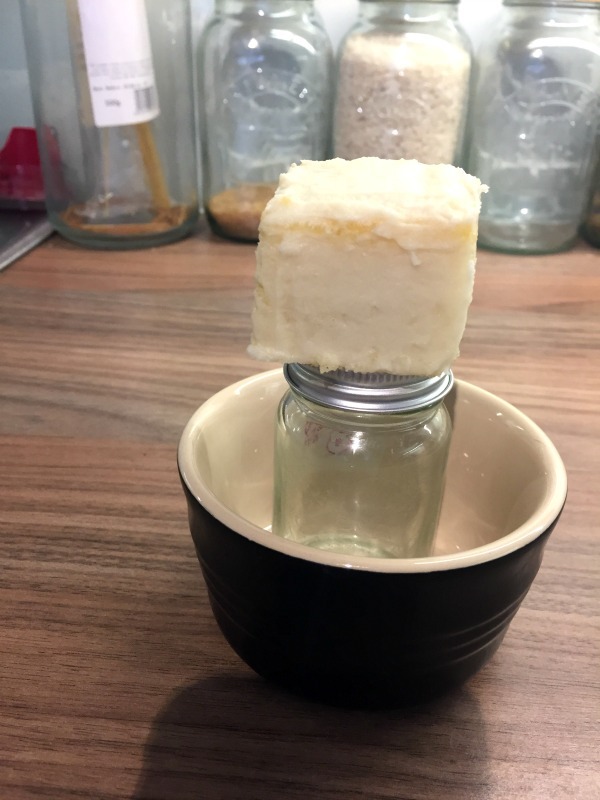 First, I set a small jar inside a ramekin, placed a cake on top and then used a spoon to pour the fondant icing on top, the dribbles then being caught in the ramekin to reuse if I needed. When it had finished dripping, I used a pallet knife to move the cake to a cooling rack with a tray underneath. The second technique was to gently put the cake on top of a fork and then again, use a spoon to pour the icing on top. This made me worry though as the cake wasn’t stable and felt like it might break off the fork. Finally, I took my big pallet knife and balanced it across my mixing bowl with the fondant in. I then put the cake on the knife and spooned the icing on. I then slid a fork ‘onto’ the knife and scraped the excess off before using the fork to slide the cake onto the cooling rack to set. This was the easiest and most secure method of icing the cakes without a doubt. Finally, after the fondant had had a minute or two to set, I placed the rainbows on top and left them to dry. 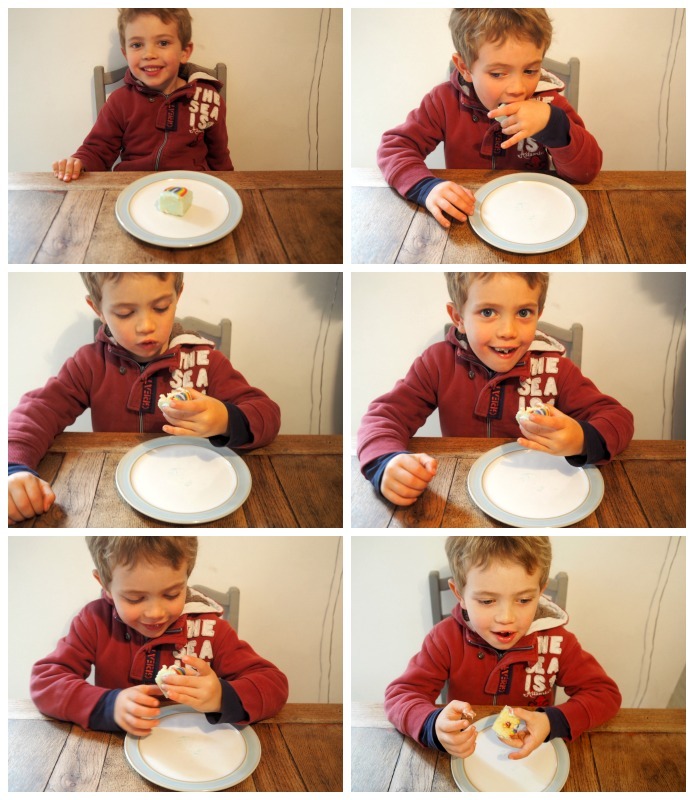 My son had been out walking the dog with my Mum when I placed the secret pot of ‘gold’ into the fancies and so I was eager to see his face when he tried one. Hs reaction was gorgeous. I am so, so pleased with the way that these fondant fancies turned out and I hope you like them too. 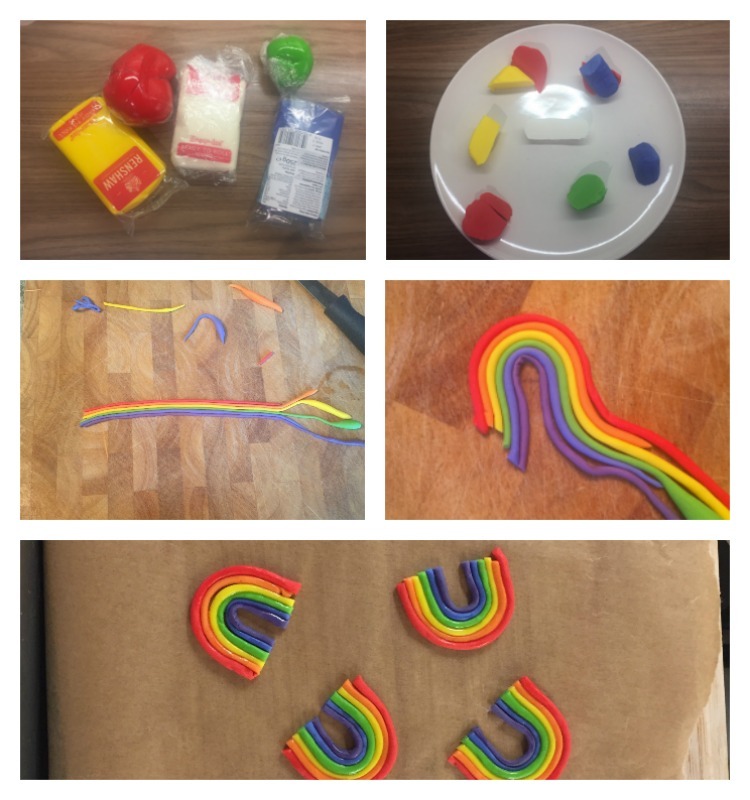 Fondant Icing in Red, Orange, Yellow, Green, Blue and Purple. Line a cake tin with non stick paper. Make your cake batter by creaming the sugar and butter / spread together. Add the eggs and almond essence, mix and then add the flour. Once combined and smooth, pour into your baking tin and bake for 30-40 mins. When you cake is cooked (a cocktail stick comes out clean) take it out of the tin, remove the baking paper and allow to cool completely. You can make this the day before icing. Make the rainbows by rolling out thin stripes of each colour and arrange one next to the other. Gently curl into a rainbow shape, trim with a knife and then dab your finger in water and gently press / rub on the rainbows and leave them to dry for half an hour. When you are ready to decorate, make your buttercream by mixing the butter and icing sugar together first and then a little milk at a time until you reach a suitable consistency. Level your cake and then using a ruler, depending on the size of the tray you have used, divide the length by 4 and mark, and then the width by 3 and mark. For me, this gave me 12 cakes, 4cm x 4 cms. Take a small utensil to make a hole in the middle of each cake, about half the depth of the cake. Fill the hole with gold or coloured chocolate nuggets for the surprise pot of 'gold', trim the cut out that you removed and place on top to cover the surprise. Coat all 4 sides of the cake with fondant icing. Place a little scrape on the board that you will let them dry on, gently place the cake on top and then coat the top of the cake with buttercream. The little scrape on the board should stop it from moving. 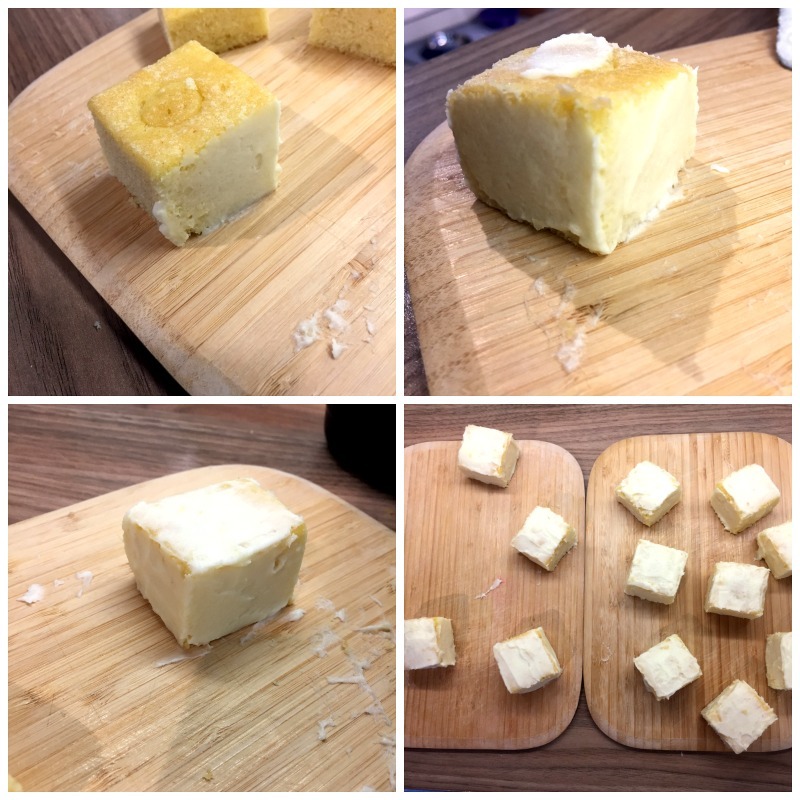 Make the Fondant Icing by chopping the block of fondant into cubes. Use a mixer to beat the fondant until it starts to soften. Add a couple of drops at a time as you continue to beat until it is all combined and you have a smooth liquid icing. Add a drop or tiny amount of gel colouring. I used a little bit of blue gel icing. When the buttercream has dried a little, take a large pallet knife that will straddle the bowl of fondant icing and place a cake on top. Use a spoon and pour the icing over all side of the cake. Let it drip and then using a fork that you can slide onto the knife, remove the excess and gently slide the cake onto a cooling rack with a try underneath to catch the drips. 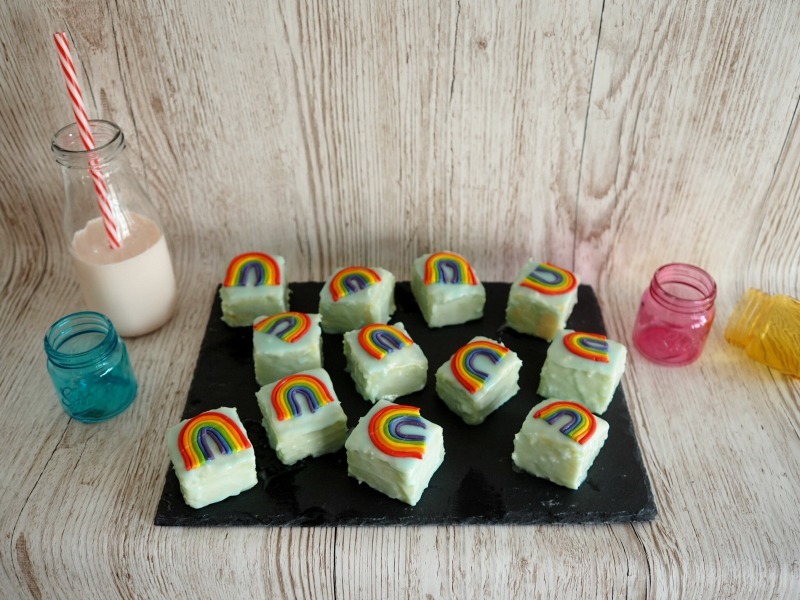 When the icing has dried a little, place the rainbows on top and then serve. They look fabulous and what a fun idea for the hidden filling and rainbow decoration. I love them! Oh that’s really kind of you, thank you but I hardly think that rolling is cheating! 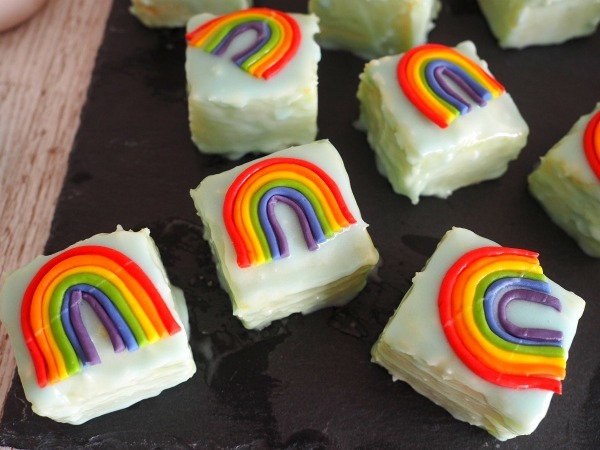 These are gorgeous, how patient of you to make all those rainbows, and what a brilliant way to get the icing on. I love that you have a surprise in the middle too. I love your mixer too, I’d really like one of those. Thank you Anne, your comments are so kind. The mixer is brilliant and really cheap! Fabulous – i am so impressed!agree that a freestanding mixer helps immensely. Thank you Tracy. It’s life changing! I’m a fan of the Halloween Fondant Fancies so when I saw you’d written this it was my go to post for #weekendblogshare Looks delicious. I’ve not come across ones with sweets in before. 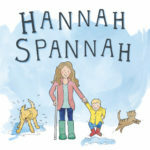 Fab Hannah! Love the little ‘pot of gold’ hidden in the middle and the pretty rainbow on the top. Love the rainbows on top and hidden surprise and they look so,tidy and pretty unlike some of the ones on the program!